Photos and Video;Police Arrest Musician Small Doctor For Unlawful Possession Of Firearm! The Lagos State Police Command has arrested Adekunle Temitope, popularly known as Small Doctor , for unlawful possession of firearms and for allegedly threatening to shoot a police officer. Small Doctor and his crew after they were arrested and paraded.. 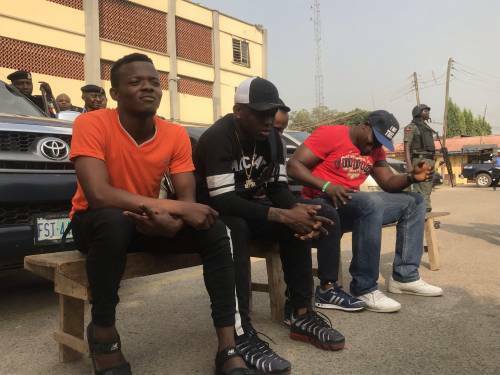 Here's how PUNCH is reporting it..
Lagos State Commissioner of Police , Edgal Imohimi , on Monday revealed this while parading the musician along with three other suspects. Imohimi said , “ It was alleged that some unknown men , four of them , in an unregistered green SUV had brought out a gun and threatened a policeman that if he does not leave the road , they will shoot him. “ Believing that they were armed robbers , I sent out my men and fortunately , with the DPO in charge of Shogunle division , they were able to intercept them and the men were arrested and were brought down to the headquarters for interrogation. “ It was then discovered that one of them is the same Adekunle Temitope,a.k.a Small Doctor’ . It is believed that Small Doctor was at some point a celebrity ambassador for the Nigerian police Force..
Watch the moment he was captured below.. He has now been released and let of with a warning as well as other conditions not revealed.